If you read my 2nd last post I believe, I wrote how I am making 5 cakes that are made out of fondant. I finally began today, considering I realized they all need to be done by the end of January… so I sort of had a moment of panic. But I managed to almost finish my first cake, which is my baseball themed one. Down below, I attached the photos of it so far (as of Sunday, December 8th). I’ll update this post when I completely finish it, so you can see the final cake. Those first four photographs are of my beginning steps. The first one, is cutting the cake to create the baseball diamond look. 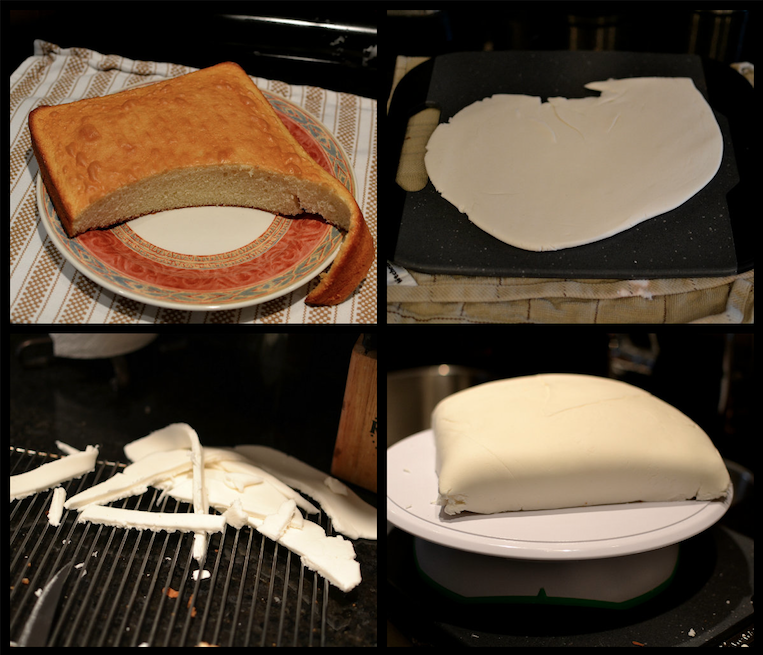 That second photograph is the process of rolling out the fondant, continued with the third photograph of all the trimmings of it. 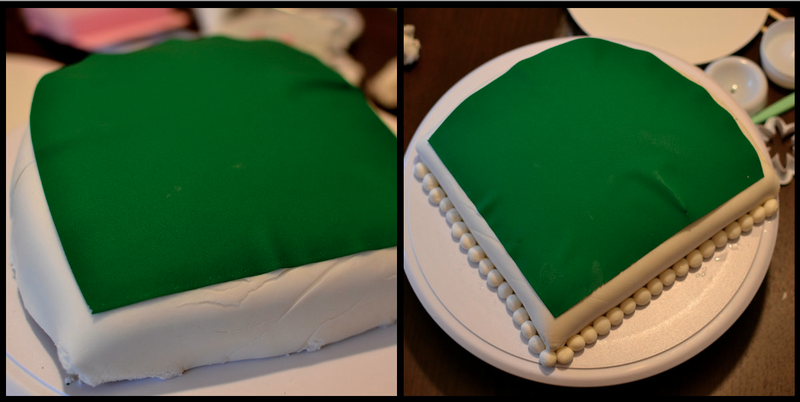 The final one is what it looked like when I draped the fondant over top of the cake. 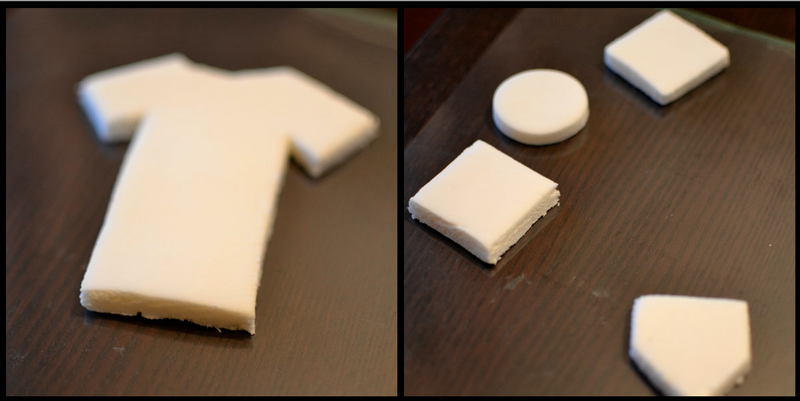 Here are two photographs of my little cut-outs I did of the baseball jersey and the bases as well as a 2-D baseball. I’ll eventually finish up the jersey with more fondant or edible paint. And finally here are the pictures of what my cake looked like once I put on the grass. The right photograph has mini baseballs lining the bottom of the cake, that I’ll eventually end up adding the red stitching onto them. What’s left to do is to create the dirt (with brown coloured fondant) and eventually add the bases on top of it, as well as the 2-D baseball for out in left field. The baseball jersey will be painted with the name Lawrie on the back of it for my favourite player Brett Lawrie from the Toronto Blue Jays. It’ll eventually be draped over the right side of the cake, with part of the jersey hanging off the side. Hope you guys like it so far! I’ll add Part 2 of this cake when I’m finished. Next Post Baseball Fondant Cake Finished!